(June 2, 2017) The giant teddy bear is 7-feet tall and 4 1/2 foot-wide: a much-loved and friendly prop to help educate our communities about the threat of?health care privatization. Private for-profit clinics are trying to take over services from our local public non-profit hospitals. They charge user fees amounting to hundreds or even thousands of dollars for diagnostic tests and surgeries, in violation of Canada’s medicare laws. The private clinics have even launched a court challenge to bring down the laws the protect patients from such user fees. 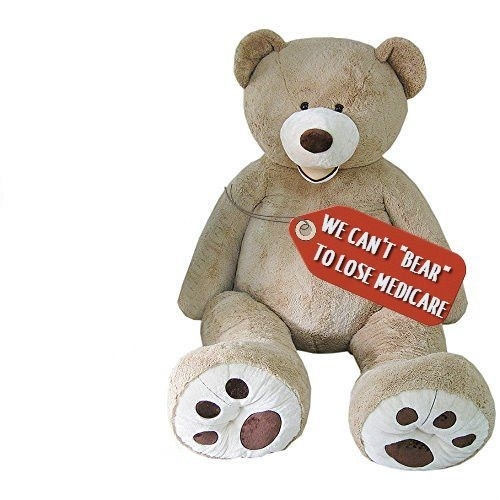 The slogan is?We Can’t “Bear” to Lose Medicare?– is a warning about the threat posed by privatization. We will be holding a media conference in each community and we will have information leaflets available to the public. We will raise funds along the way to cover the cost of the tour and to help the B.C. Health Coalition intervene in the legal challenge brought by the private clinics. All are welcome to join. Please come out and help spread the word! May 30, 12 p.m. Corner of King & James downtown. June 5, 10:30 a.m. Byward Market, S/W corner of George & William Sts. June 5, 2:30 p.m. N/E corner of Pitt and Second Sts. June 6, 9:30 a.m. Outside City Hall King & Market Sts. June 6, 12:00 p.m. Outside LaSalle Mews, Princess St. (Outside MP Sophie Kiwala’s office). June 7, 10:00 a.m. Downtown farmer’s market, Charlotte St. between George and Aylmer St. N.
June 7, 3 p.m. ?Park across from hospital,1 Hospital Ct.
June 8, 12 p.m. In front of Town Hall, 2 Wellington St.
June 8, 3:30 p.m. In front of City Hall, 200 King St.
June 9, 10:30 a.m. outside City Hall, 400 City Hall Sq. June 9, 2:30 p.m. King St and the 5th St Bridge. June 10, 10:00 a.m. Fountain Park at intersection of Dufferin Ave., James St and McNaughton Bridge. June 10, 1:00 p.m. Waterfront Park, by the bridge. June 11, 10:30 a.m. Outside Town Hall, 184 Queen St. E.
June 11, 1:30 p.m. Upper Queen’s Park by the Festival Theatre. June 11, 4:30 p.m. Outside City Hall Dundas & Reeve Sts. June 12, 10:30 a.m. Old Court House Parkette at 101 King St (corner of James & King Sts). June 12, 2:00 p.m. Douglas Park across Douglas Memorial Hospital –230 Bertie St.
June 14, 1:00 p.m .- City ?Hall – 500 Donald St E.